Depending on your climate (and HVAC system) dried herbs can go moldy. A big cause of mold is too high of humidity. That’s the reasons for all those silica gel packets in items you get. 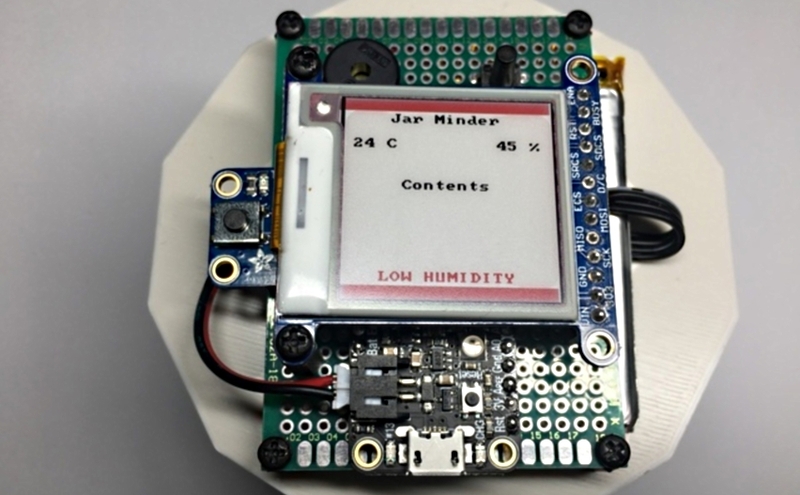 If you store a lot of dried herbs or anything that requires a controlled humidity (and/or temperature) environment, this project can help by monitoring the temperature and humidity in a container and warn you if they go out of the desired range. This project uses an Adafruit Feather M4 Express. This board is reasonably priced and is the author’s go-to board for most projects. A huge advantage is the Feather battery charging circuit. This allows the battery to be charged without having to disconnect and remove it. The Feather also has far more I/O pins than a board like the Trinket. This makes possible display using the Adafruit 1.54″ square 3-color eInk display, a huge benefit on a device like this. It wakes up approximately every hour to take readings, update the display, and possibly raise an alarm. It’s not powered the rest of the time. Using eInk provides a persistent display that remains “on” and informative all the time without requiring power. The downside of eInk is that screen refresh is a slow process. But when you only need to update every hour, that’s not a problem. The SI7021 is a reliable, robust temperature and humidity sensor for taking readings. Check out all the build details in this new Adafruit tutorial.